If you have already RSVP’ed and CAN attend, you do not need to do anything. If you have already RSVP’ed, and CANNOT attend, please email regrets to: odonnell-nicole@cooperhealth.edu. If you could not attend 3/14, but can attend 3/21, please RSVP by calling 1.800.8.COOPER (1.800.826.6737) or online at events.cooperhealth.org. 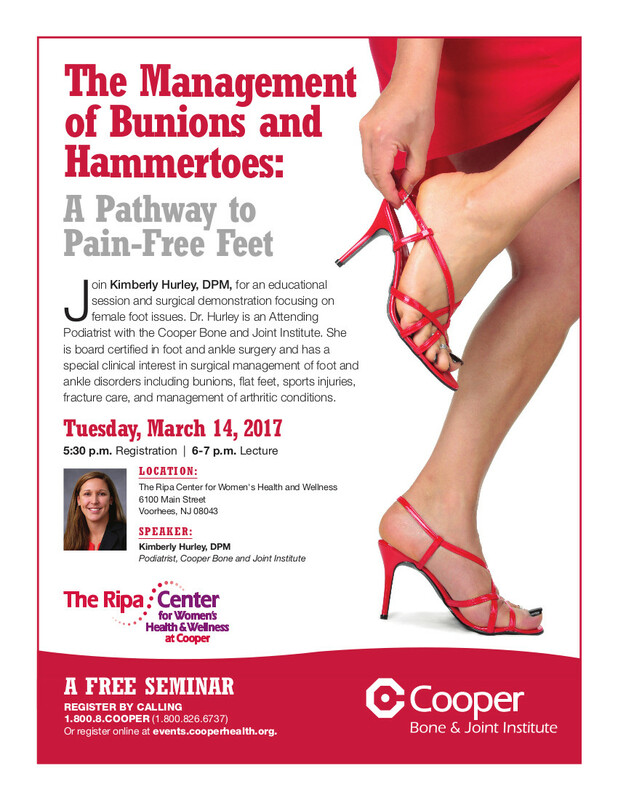 Join Kimberly Hurley, DPM, for an educational session and surgical demonstration focusing on female foot issues. Dr. Hurley is an Attending Podiatrist with the Cooper Bone and Joint Institute. She is board certified in foot and ankle surgery and has a special clinical interest in surgical management of foot and ankle disorders including bunions, flat feet, sports injuries, fracture care, and management of arthritic conditions.